Churches are not just about religion and faith; they are also about artistic beauty, history, and heritage. For some people, churches are places where they can take a walk through the realms of time and get a glimpse of ancient architecture and craftsmanship. For others, such houses of worship are serene spaces where they can discover peace and tranquility. And if you are in Pune, you can find a number of churches that tick all these boxes and perhaps, more. How about discovering more about these marvelous shrines that are odes to all things artistic, ancient, and tranquil? 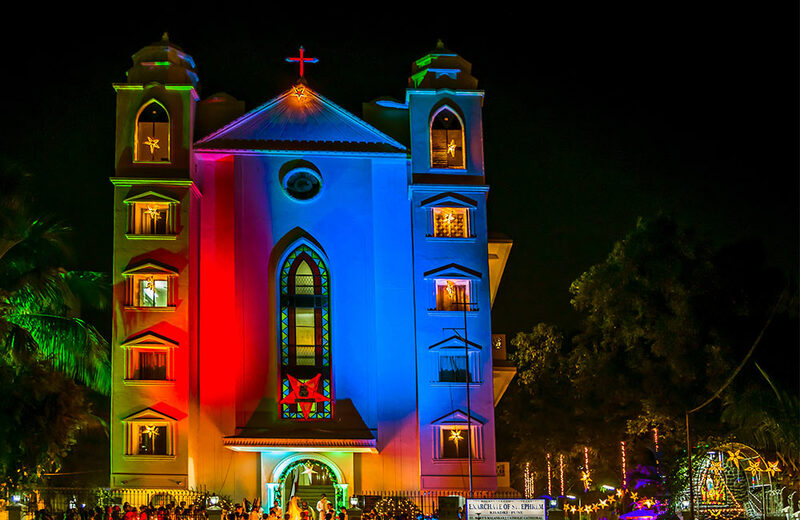 Let’s check out some of the must-visit churches in Pune. A magnificent shrine from the British era, St. Mary’s Church is located in the Cantonment-Camp area of the city. It was built in the early 1820s by Lieutenant Nash, an engineer of the East India Company, and consecrated in 1825. 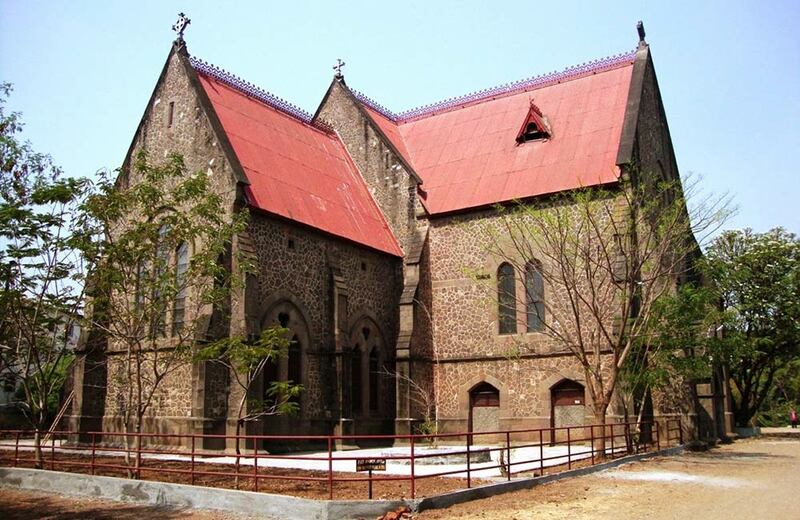 St. Mary’s is not just the oldest church in Pune but in the whole Deccan region itself. As such, it is also known as the mother church of the Deccan. The landmark shrine is an architectural splendor. You can find a beautiful amalgamation of Gothic, British, and Indian styles of architecture defining the beauty of this church in Camp Pune. Among the main attractions of this historic edifice are its 103 feet high tower and a quaint winding staircase that leads to the gallery. And while you are here, do not forget to check out some of the other attractions, such as the 130-year old pipe organ and the bell brought from Kaira church. Given the spacious interior of the structure, it can accommodate up to 1000 worshippers at a time. With a history of more than 150 years, St. Xavier’s Church stands as one of the must-visit historical places in Pune. Among the Catholic churches in Pune, it is the first one to be run by Jesuit priests. Once you walk in through the lovely gates of this edifice, you won’t be able to ignore the enticing old-world charm that this place exudes. Its gloriously arched entrance, cobblestone exterior, high ceilings, colorfully stained glass windows, and walls ornamented with oil paintings showcasing the life of Christ, all come together to give the structure a unique look and feel. Visiting this church is a cultural experience in itself, something that you must not miss out on your visit to this city. As a place of worship, this church in Pune attracts people belonging to all communities due to its tranquil atmosphere and solemnity. And the best part? St. Xavier’s is located within 10km from some of the major hubs, such as Shivaji Nagar and Viman Nagar, where you will also find many budget hotels in Pune. When it comes to the tourist places to visit in Pune, you can’t possibly give a miss to the All Saint’s Church, a beautiful stone structure that traces its origins back to the 19th century. This serene house of worship stands surrounded by tall trees and lush greenery and boasts of Gothic architectural features. The quaint edifice has a bricked exterior and is adorned with a red roof while its gorgeous interior presents a sight to behold. High teak wood ceilings are complemented with colorful stained glass that enhances the overall beauty of the church. There’s even a bandstand balcony located above the main entrance door on the north, adding to the old-world charm of this famous church in Pune. The building served as a garrison church for the military during the British era. Today, it attracts the attention of believers and tourists in equal measures and is definitely worth a visit. 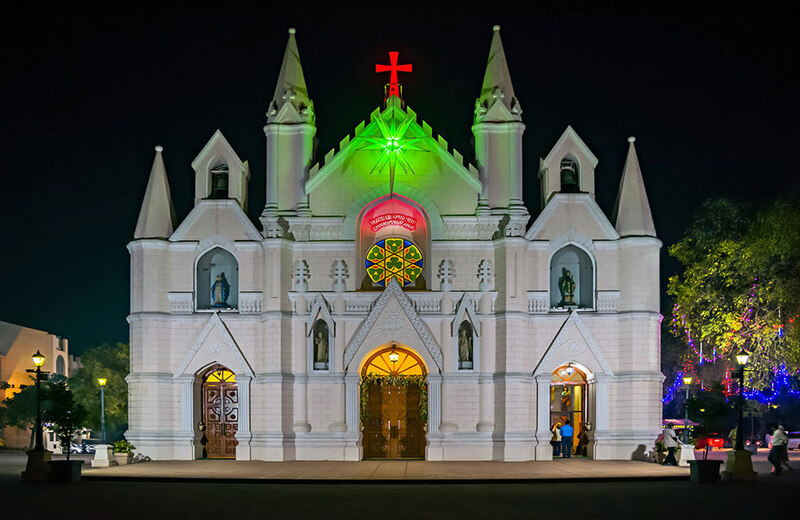 One of the most celebrated Roman Catholic churches in Pune, St. Patrick’s Cathedral has been adorning the landscape of the city and attracting visitors for more than 160 years. The origins of this place of worship date back to the mid-19th century; it was adopted as a cathedral in the year 1886 when Pune was made a diocese. 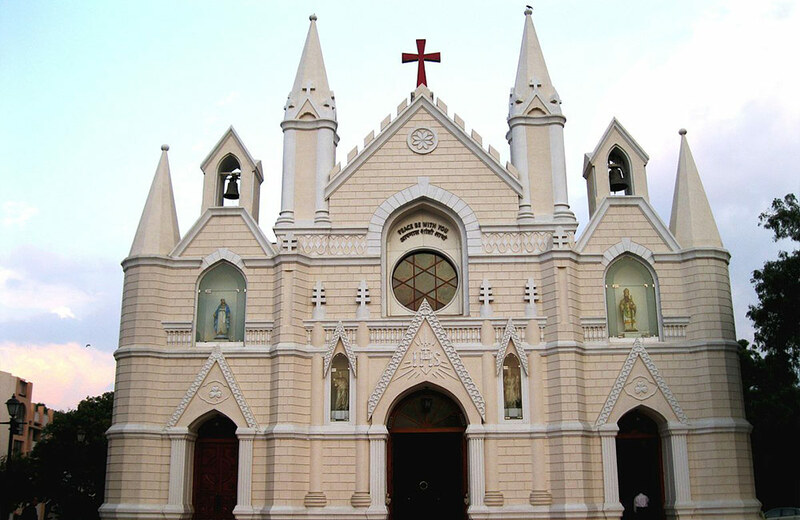 It still remains the main church of Pune and boasts of the highest number of parishioners. St. Patrick’s Cathedral is a towering edifice that exhibits the neo-Gothic style of architecture. The grand structure boasts of two bell towers that adorn its front exterior. It is a cultural heritage that attracts visitors from far and wide. Among the major attractions of the church are its 16 theme-based stained glass windows, each of which illustrates episodes from Jesus Christ’s life, and a skylight strategically placed above the altar that depicts the Descent of the Holy Spirit. Believer or not, you can drop in at this Cathedral just to appreciate these artistic marvels. 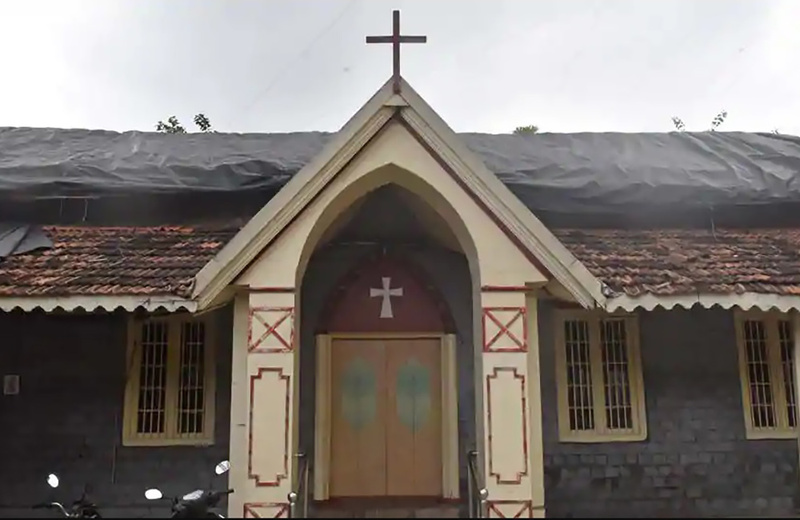 It might sound like a very unusual name for a church, but Brother Deshpande Memorial Church has a fascinating history that draws the attention of believers and tourists alike. To begin with, this church is dedicated to the memory of Ramchandra Pralhad Deshpande, an orthodox Brahmin who hailed from the Nagpur district of Maharashtra. He was a staunch Hindu who later converted into Christianity and dedicated his life to the service of the poor and the downtrodden. This church is located in Kasba Peth, which is one of the oldest regions of the city and is symbolic of the social life that flourished in Pune back in the 19th and 20th centuries. The building is an L-shaped structure built in the Gothic style of architecture. The name, history, and architecture have earned Brother Deshpande Memorial Church a place in the list of best churches in Pune. Speaking of history, churches are not the only places where you come face to face with the past and its glories. While in the city, you can also visit some of the most popular museums in Pune. Now that you know everything about the most important churches dotting the city, make sure to plan your itinerary accordingly. And while you are here, do not forget to check out the other things to do in Pune as well, even if you are there for just a couple of days. Also, check out the malls in Pune that are a haven for a shopaholic along with its restaurants and nightclubs, all of which define the youthful vibe of the city. So, here’s to an exciting trip to Pune!